We work with many Federal, state and local government agencies providing Deaf interpretation and captioning services. Please fill out the contact form below and we'll get back to you as soon as we can. Have questions? We'd love to hear from you. Go ahead, expect too much. DSU provides sign language interpreting and captioning services for the Deaf and Hard of Hearing, both on-site and over the internet. Unlike other firms who interpret many languages, our specialization allows us to address the unique communication and cultural aspects that are not commonly shared by other spoken languages. For over 20 years, we've worked with many Federal, state and local government agencies and have facilitated more than 1,000,000 conversations. Our team of interpreters is available 24 hours a day, 7 days a week, 365 days a year. Every service you need – on demand. Large national network of interpreters available anywhere in the country. Communication Access Real-time Translation (CART) is a form of captioning that can be provided on-site or remotely, usually for live presentations such as meetings, classes, or conferences. Caption training videos, commercials, public service announcements, and more. Culture and language intertwine, with language reflecting characteristics of culture. Learn about the rich culture of Deaf people while also learning about their language. 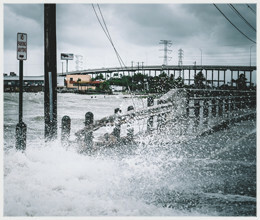 When Hurricane Harvey made landfall in Texas on August 2017, it became the country’s first Category 3 or higher hurricane since 2005. Harvey kicked off a historically destructive 2017 storm season. Within hours of contract award notification, DSU had interpreters on assignment. DSU provided interpreting services for FEMA’s relief efforts from early September through December 2017. As part of the relief efforts, DSU had interpreters deployed throughout Texas on various assignments 24/7. DSU interpreters worked with Deaf employees at FEMA on projects and meetings that included: operations, housing, National Emergency Management Information System (NEMIS), training, accessibility information, and meeting with survivors with accessibility needs. Interpreters were also “out in the trenches” with FEMA employees – hiking through debris, wading through floods, and looking for survivors. DSU provided interpreting services in pop-up shelters across the state of Texas. Deaf residents affected by Hurricane Harvey successfully received interpreting services when they needed them most. In all – Deaf Services Unlimited had over 25 Certified Interpreters and Certified Deaf Interpreters working throughout Texas on Hurricane Harvey relief.